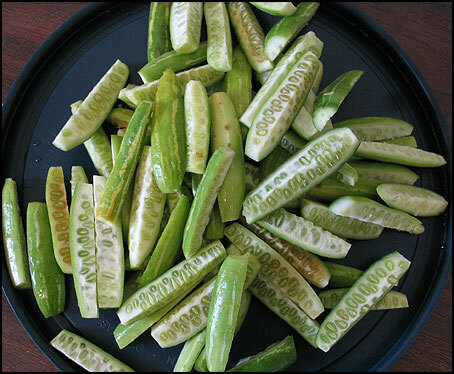 Kovakkai (ivy gourd) is not that common in Jaffna, Sri Lanka. But it’s a very common vegetable in South India. I have already posted a recipe for Kovakkai — Kovakkai fry (Kovakkai Varai). 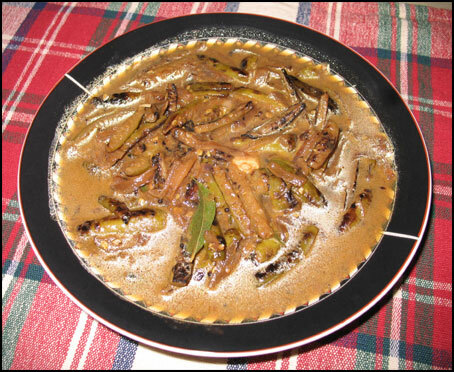 This time I am posting a recipe for Kovakkai Gravy or Kovakkai curry. once again thank you for such a tasty site!..do you have a picture of ivy gourd befor it is cut?I am not sure I know how this vegetable looks! and when I buy curry leaf it comes in quite a large bunch,how do sri lankan cooks keep it fresh,or is it also used dried?how many curry leafs does one use in a dish like this? Thank you and Bon appetite! Unfortunately I dont have a picture of this vegetable with me now. But will definitely post the picture next time I buy this vegetable. When it comes to curry leaves, I buy them in small bags (thats how they sell it here in USA.). So small bag would contain about 10 – 15 strands of curry leaves. Normally I store them in the bottom shelf/container in my refrigerator. When you store like this, make sure you keep them in an air tight polythene bag (ziploc). It can last for about a month. You can also store in the freezer. But over time the leaves will become so dry and will lose the fragrant. It depends on how much smell you want. You can use 1 strand of curry leaves for this dish. But if you want a strong smell, you can use more. Its not going to harm anything — its good for health anyway. Thanks for the offer. I will let you know via this reply once I customize it. Immediately I cannot. But definitely a good idea!